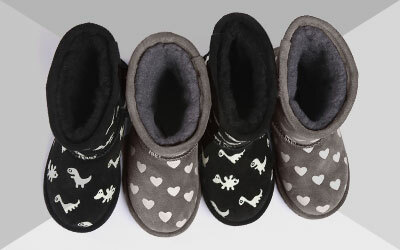 The Wallaby Mini suede ankle boot for children is a cute and fun boot made for everyday wear. This boot for kids by EMU Australia is made with premium suede and lined with soft Merino wool, and it comes in classic colors such as black, tan and gray as well as more colorful options like pink. Comfortable and functional, the original Wallaby Mini suede boot for children is a classic year round ankle-height boot. Made with luxury natural suede and cozy Australian Merino wool, this cute and classic boot for kids ensures warmth and comfort for little toes. But it’s also ideal for wearing in warmer summer weather, since our natural materials are really breathable, meaning it keeps children’s feet cool and dry. And since these boots easily slip on and off, they’re ideal for getting the kids dressed on busy mornings, and great for traveling. 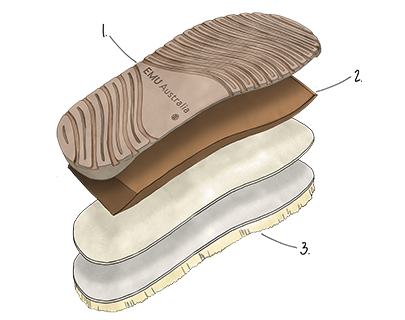 A dual density outsole, with extra cushion EVA, provides optimum traction and grip whilst the molded heel provides a superior fit and comfort. The materials used in the creation of the Wallaby Mini boot for kids are natural and also Woolmark accredited.